An issue-by-issue look-back at the news in Revelstoke from April to June 2016. Revelstoke Mountain Resort is celebrating a banner season, with a double-digit increase in skier visits resulting in it’s best season ever. The season wrapped up on the weekend with two days of sunshine, blue skies and lots of celebrating on the mountain that was capped by a packed show by the band Shred Kelly on Saturday afternoon and a snowball fight at the top of the Stoke on Sunday. The season started off strong for RMR, which had its biggest opening day in late-November. Nielsen said the momentum kept going throughout the year, with one of the biggest drivers being destination visitors. “We saw a marked increase in people who have to get on planes to get to Revelstoke,” he said. “That drove midweek visitors. 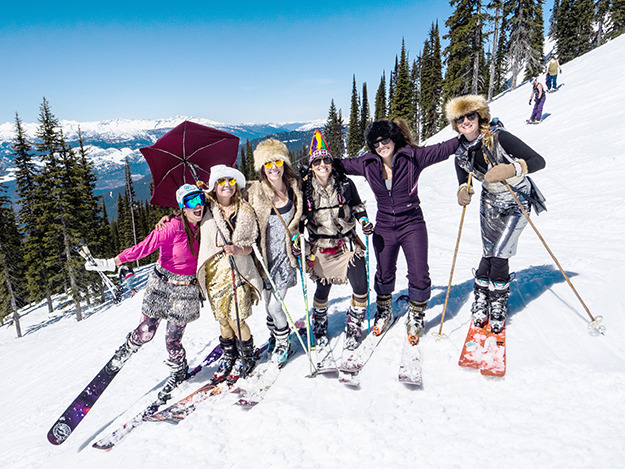 Photo: From left: Emma Mains, Jesse Johnston-Hill, Leslie Hogg, Ashley Borlase, Meghan Tabor and Leah Evans got all dressed up for closing day at Revelstoke Mountain Resort. After a trial spanning four months and deliberations over seven days, the jury tasked with deciding the fate of a former New Zealand politician accused of drowning his wife in a B.C. lake could not come to a unanimous verdict. Peter Beckett’s jury returned hung at about 6:45 p.m. on Tuesday, Apr. 12, less than four hours after passing a note to B.C. Supreme Court Justice Ian Meiklem saying they were at an impasse. Meiklem urged the jurors to push on and come to a unanimous verdict. In the end, one dissenting voice caused the mistrial. “Totally predictable,” Beckett told KTW just before the hung jury, by that point a foregone conclusion, was made official. The victims of a plane crash near Trout Lake have been identified. Lynndon Wayne Delisle, 58, and his wife Heather Lynn Delisle, 54, died after their plane went down in the mountains southeast of Revelstoke on Monday, April. 11. The crash was discovered by a helicopter pilot with the CMH Galena heliskiing lodge, wrote lodge manager Mike Welch in an e-mail. Nicole Salter sat on the bank of the Columbia River bawling. Hours earlier, she and Craig Lagore watched as their best friend Leslie Wetselaar was swept away in the current. “He was my best friend,” she told me. They had been hanging out at the Centennial Park boat launch last Wednesday, Apr. 21, when Wetselaar lost his balance and fell in. Lagore and Salter tried to pull him out, but were unable. Les, as he was known, was torn away in the current. The Revelstoke RCMP, Search & Rescue, and Fire Rescue Services began an extensive search of the river. A police boat and private boat set out onto the water while an RCMP helicopter was brought in to look from above. Teams walked the shoreline as far as the 12 Mile flats but after two days of searching, they were unable to find Wetselaar. The estimated cost of to fix Revelstoke’s main highway intersection has nearly double to more than $2 million, according to a new report by the consulting firm hired to oversee the project. McElhanney Consulting has produced its final design to fix the intersection of Mutas and Victoria Roads. It makes minor changes to the plans presented at an open house in March. Notably, it modifies the access to the frontage road that passes the Shell Station, and improves pedestrian access to the Shell. It also scraps the proposed roundabout at Laforme Boulevard and Fraser Drive. Significantly, McElhanney estimates the cost of the project at $2.1 million, far more than the $1.2 million the city has budgeted for the work in its 2016–20 financial plan. When the Almastou family arrives in Revelstoke from the refugee camp in Jordan where they now live, they’ll have a nice home with lots of space ready for them. Reilly Geidt and Kristina Welch are donating space in their five-bedroom house in Southside to Rakan & Medheya Alamstou and their five children. “We have a lot of space and we can do it, so we felt like we should and we wanted to,” Welch told the Review in an interview. Geidt and Welch live in a five-bedroom, two-bathroom house with a huge back yard in Southside. The house has four bedrooms and a bathroom upstairs, and one bedroom, a bathroom and kitchen downstairs. They are renovating it to add a second kitchen and the Almastou family will be given the upstairs and the front part of the main floor. “The house is naturally set up to be divided like that,” said Welch. CP Rail is looking at moving workers from Revelstoke to Golden in order to create an extended coal train run that would eliminate crew changes here. It says no jobs would be lost, but does not say how many positions would be moved out of Revelstoke as a result of the change. A split council approved moving forward on a design for the Trans-Canada Highway intersection at a special meeting last Wednesday. Councillors Linda Nixon, Scott Duke, Aaron Orlando and Trevor English voted in favour of a design that would include a roundabout at Victoria and Wright, block left turns into the Tim Hortons/Shell and out of the Woodenhead Loop; and keep the Bend/Frontage Road loop. Mayor Mark McKee and coun. Gary Sulz voted against the plan. McKee wanted to explore putting a traffic light at the railway bridge over Victoria Road to see if holding up highway-bound traffic there would alleviate the problem. “I don’t like the idea of us throwing out a $300,000 option and going right to $2 million without having all the information,” he said. A fight could be brewing between Revelstoke’s hoteliers and the developer who’s attempting to enter the club. The Revelstoke Accommodation Association is asking city council to oppose David Evans’ proposed Treehouse Hotel, saying it could hurt future infrastructure development at Revelstoke Mountain Resort. 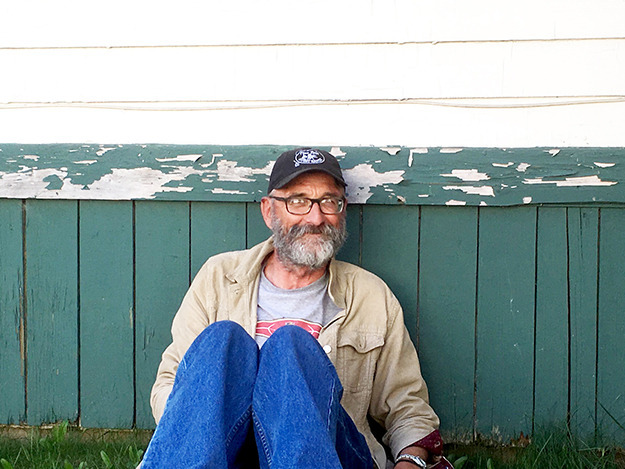 After 11 years serving the people of Columbia River–Revelstoke, as well as many years before that serving Golden as Mayor, MLA Norm Macdonald has decided it is time for his political career to come to a close. He has decided that he will not seek re-election next spring. Instead he will be returning to his first passion, teaching. At 58, Macdonald has decided that he can’t push it back any further if he wants to end his working life as an educator. 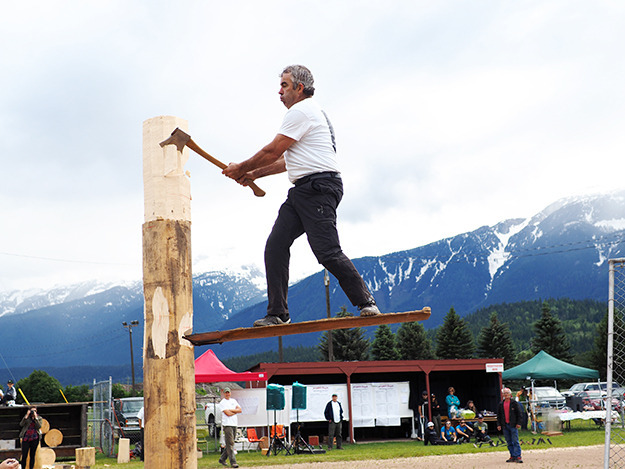 Photo: Karl Bischoff takes part in the log springboard chop during Timber Day in May. The pro show was brought back to the event in 2016 after a hiatus of several years. The battle between Revelstoke Mountain Resort and developer David Evans over the proposed treehouse hotel continues to heat up. The latest salvo comes from Evans, who has said he’ll hold off full development of his proposed treehouse hotel for five years, but only if RMR commits to building a new chairlift, opening new ski terrain, building a new restaurant at the top of the gondola, expanding summer tourism options and building a bike park within the next five years. In exchange, he says he’ll only develop 25 per cent of his property until five years have passed. The clash of hammers and the whirring of drills are a constant reminder of the major changes happening inside the historic McKinnon Building in downtown Revelstoke these days. The historic building is seeing its biggest facelift ever as it gets transformed into a new combination restaurant/hotel/event space by its new owners Rebekah and Stephen Jenkins. The interior has been gutted, the ceilings and walls removed and truckloads of concrete removed from the basement as the new owners turn the building into The Explorers Society Hotel. “The space is magical, we started to have visions for what we could do and they radically evolved from there,” Rebekah told me during a tour Friday morning. A few weeks ago, Kristian and Sarah Dart went to look at a house for sale on First Street. It was a private listing that was advertised online as a “tiny home” with a garage for just under $200,000. They went to see it as quickly as possible, but they were too late. “They had three offers within the first 24 hours it was up on the Stoke List,” Sarah told me. It wasn’t the first time that happened to them. The first house they wanted to look at, which they described as an old character home on Fifth Street, sold a day after they inquired about it. Those kinds of stories are becoming more and more common as Revelstoke’s housing market has heated up over the past year. Multiple offers being made on some houses, some are sold within days of being listed, and anything below $300,000 is going quickly, no matter kind of shape it’s in. There were 120 homes sold in Revelstoke last year, and 49 so far this year as of early June. More than 70 per cent of them went for $200,000 to $400,000. The average sale price of single family homes has climbed to $364,498 so far this year from $331,109 in 2013 — a 10 per cent increase.